The introduction this year of Vine and Instagram videos spawned a new kind of content marketing: the short-form social video. What does this mean? It means video that's super-snappy: just six seconds for vine, 15 seconds for Instagram. And it comes with social media sharing elements baked right in, not bolted on. Vine is owned by Twitter, so videos can be embedded in an in-stream tweet; Instagram is owned by Facebook and is an active social photo platform in its own right. I am a sucker for content-creation tools that are intuitive and flexible, as well as intrinsically social. So I love the opportunity these platforms present. Visual content is, of course, engaging: People are four times more likely to share Vines than other videos on Twitter, according to one study, which also noted that five Vines are being shared on Twitter every second. That's not as hyper a channel as YouTube, perhaps, but it still translates into almost half a million Vines a day. They're stupid-simple. Creating good video is hard. Editing good video is even harder. Just as Instagram put wizard wands into the hands of muggles, allowing amateurs to create and share beautiful and expressive photographs, so do the new tools democratize the video-making process. From the least cinematic among us to J.J. Abrams, everyone can now shoot and edit elegant clips using the same basic toolkit and intuitive interface. We all suffer from ADD. There's always a brighter and shinier object a mere click or scroll away. So we become a bit like the dog Dug in the movie Up--easily distracted by the squirrel moving just beyond our view. How many videos have you watched and abandoned because the producer seemed to have been paid by the second? Most digital videos beg to be shorter, punchier, tighter. A key to all good content is this: Edit, edit, edit! (Then edit some more.) As Faulkner said, paraphrasing someone else: "Kill your darlings." Short-form video bans bloat by not allowing a single gasp of oxygen beyond the set time limit. In our world of media-induced ADD, you had better learn to distill the essence of your story into something that respects your audience's time. Broad application. The best content-creation platforms and tools are like Montessori schools: The truly talented can leapfrog to the head of the class and wow us, while the slow-blinking among us never feel too embarrassed. In other words, anyone with a smartphone can create a short-form video (although not everyone can do it exceptionally well). So what might your business create with these tools? Useful how-tos. 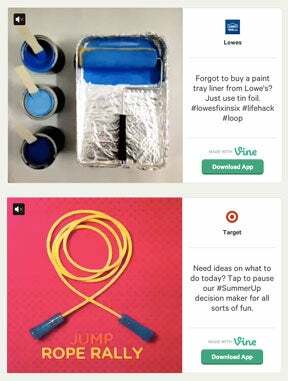 I like the Lowe's series of "Fix in Six" Vines that offer handyman tips and household hacks for the DIY crowd. Each six-second looping video solves a pesky home-improvement challenge. How do you remove a broken light bulb from a lamp socket? (Use a potato.) Need a third hand? (Wrap a rubber band around your pliers.) It's a great example of truly useful content that makes your customer smarter--and doesn't just shill the things you sell. The bigger story. Target is using short-form video to tell a broader story of what sets it apart: clean design and a hip approach to life. The retailer's "#SummerUp Decision Maker" video offers a host of activities in rapid succession, inviting people to tap to stop the video like a summer-fun roulette wheel. My company, MarketingProfs, did something similar in the B2B space, producing a Marketing Magic 8 Ball that businesses could tap and freeze--a fun way to get advice on thorny questions tied to the theme "Marketing is full of choices." The behind-the-scenes look. Café Moka, a coffeehouse in Virginia Beach, Va., uses short-form video to show just how the barista creates that familiar leaf design on the top of your latte. The visual experience. Lights! Camera! And … an empty stool? I like the way SweetShot Photography's Glynis Citarelli uses video to show, not tell, how her business is ready and waiting for you. It allows potential customers to literally envision themselves at her studio, showing exactly what the experience would be like. Contests. Real Life St. Louis, a blog published by the rental-property owner Mills Properties, holds a Vine contest on select Fridays. In July it released movie clips and challenged residents to guess the titles for a chance to win tickets to a St. Louis production of West Side Story. The contest is a smart way to increase engagement and sign-ups for the company e-mail list. This is only a handful of ideas, of course. With short-form social video, the ideas (and the bandwidth) are limitless!